Provide comfort for the family of Anita Savoca with a meaningful gesture of sympathy. FAIRPORT/MASSENA – Mrs. Anita L. Savoca, 89, of Fairport, NY and previously of Massena, NY, peacefully passed away Tuesday afternoon, December 4, 2018. Anita was born September 8, 1929 in Massena, the daughter of the late Armand J. and Simone M. Ouellette LaMarche. She was a 1947 graduate of Massena High School. On October 15, 1949, she married Toni P. Savoca at St. Mary’s Catholic Church with Rev. Charles Flaherty, officiating. Anita worked at Warner Brothers Garment Factory, ALCOA, Brad’s Big M, and Sears. She was a member of the American Legion Auxiliary Post #79 and the VFW Auxiliary #1143. She served many years as Secretary of the Massena Woman’s Bowling Association and taught Junior Bowling. She was a volunteer at the Red Cross, St. Vincent DePaul, and the St. Mary’s Bereavement committee. 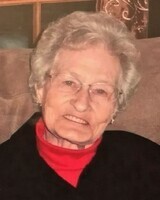 Anita is survived by her loving husband of 69 years, Toni; her children, Kathryn Savoca of Rochester, NY; and Steven and Laura Savoca of Fairport, NY; daughter-in-law Wilhelmina Savoca of Deer Park, IL; nine grandchildren; twelve great grandchildren; and many nieces, nephews, and cousins. 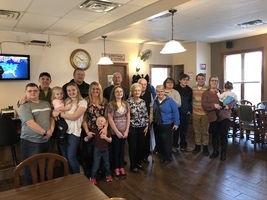 In addition to her parents, Anita was predeceased by a son, Michael Savoca; a grandson, Michael Jason Savoca; and by her siblings, Muriel Feeney, Gaetan LaMarche, and Jean Claude LaMarche. Friends may call Sunday 1-4 PM at the Donaldson Funeral Home, Massena. A Mass of Christian Burial will be celebrated Monday 10:00 AM at St. Mary’s Catholic Church, with burial at the Calvary Cemetery. Memorial contributions in Anita’s memory may be made to The Michael P. Savoca Memorial Foundation, a not-for-profit charitable entity that supports organizations dedicated to raising awareness and finding a cure of Pulmonary Fibrosis. The Michael P. Savoca Memorial Foundation, 20731 Swansway, Deer Park, IL 60010. 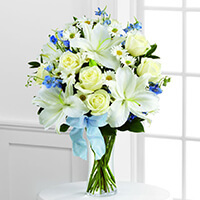 To send flowers in memory of Anita L. Savoca (LaMarche), please visit our Heartfelt Sympathies Store. Donations are being accepted for: MICHAEL P SAVOCA MEMORIAL FOUNDATION. The Maxwell’s sent flowers to the family of Anita L. Savoca (LaMarche). Kathy - Steve and Families - Very sorry to hear your mom passed. Our thoughts and prayers go out to you all. We are so sorry for your loss. Many memories for all of us, living in the neighborhood. With the deepest Sympathy, our thoughts and prayers are with you. The Maxwell’s purchased the The FTD Sweet Peace Bouquet for the family of Anita Savoca.